The world has entered a period of greater political instability with the surprise outcomes of Brexit, the US Presidential Election and a number of heated elections across Europe in 2017. Growth prospects across the globe are therefore mixed. Nonetheless, the forecasted global GDP has been revised upward by the IMF to 3.4% for 2017. The drivers behind the revision are fiscal stimulus and policy changes in the US. The major news in the US economy was the actions taken by the Fed, despite expectations when looking at Fed Funds futures. In mid-March Janet Yellen announced the decision to move forward with raising key interest rates 0.25% to a target range of 0.75%-1.00%. This rate hike is only the third time rates have gone up since the Fed set rates at zero in 2008 due to the Financial Crisis as a way to stimulate the economy. Guidance on future rate hikes for the rest of the year remains unchanged with a forecast of a Fed Funds rate of 1.4% for 2017 year-end. The Fed continues to monitor the US economy, particularly the employment situation, for their decision-making. Given the quantitative easing the world has seen since the Crisis, the balance sheets of the US central bank, and others, have increased dramatically. However, the Fed is likely approaching the next phase in the program: steadily decreasing the balance sheet by no longer reinvesting principal. Furthermore, many positive market fundamentals developed in Q1 including the sales growth of S&P 500 companies steadily increasing over the previous several months. Earnings growth also saw meaningful improvement. Since the end of Q1 however, some of the exuberance has waned with jobless claims increasing, housing starts showing weakness and the broader manufacturing industry appeared to lose momentum. President Trump’s proposed policy changes, most notably his attempt to repeal Obamacare, failed to progress. The struggle to get his promised policy changes through in his first 100 days has caused investors to question whether or not the infrastructure build-out, lowered corporate tax rate plan, and changes to healthcare will occur. The focus in international markets is twofold: upcoming elections in Europe and growth in China. Elections are occurring throughout Europe in France, Germany, Italy and the Netherlands for example. The Brexit vote and election of President Donald Trump sparked an anti-establishment movement and wave of populism that is central to these upcoming elections. The Brexit plan continued on March 29th when Prime Minister Theresa May triggered Article 50, giving Britain two years to negotiate an exit deal from the European Union. The French election will continue with a run-off on May 7th between far-right Marine Le Pen and centrist Emmanuel Macron. All eyes are on polling results and potential outcomes of European elections given the impact each could have on the continuation of the EU and the euro. In emerging markets, growth in China appeared to stabilize as Q1 2017 GDP growth was expected to be 6.5% for 2017. In mid-April however, that level was surpassed reaching 6.9% of growth, the highest level since the fall of 2015. Despite appearing more stable, Massey Quick Simon remains cautious as there are a number of unresolved risks associated with the country. The first quarter of 2017 continued the strong performance seen since President Trump was elected in November. January and February saw over +1.5 returns each while March results ranged from essentially flat to slightly negative. There was, however, a reversal compared to 2016 from a style and capitalization perspective, as large cap stocks outperformed small cap and growth outperformed value. Similarly, laggard sectors in Q4 2016 were the strong performers for the quarter including information technology up over 12.5%, and healthcare and consumer discretionary both returning nearly 8.5%. Energy declined near -6.7% coinciding with oil prices falling due to increasing rig counts and inventory builds. In contrast to the past several quarters, international equities outperformed domestic equities. Emerging markets were the belle of the ball seeing massive inflows, driven by what appears to be the end of the commodity drawdown and the previously mentioned stability in China. Despite energy experiencing a drawdown, the IEA announced during the quarter that OPEC was 90% compliant with their production cuts but many investors are waiting for more clarity out of the next OPEC meeting in May. These two signs of stability pushed emerging markets to return a strong 11.49% in Q1, nearly doubling US equity performance. Bottom Line: While Massey Quick Simon remains positive on equities, high returns will be harder to achieve in the short to intermediate term without significantly higher GDP growth. Growth oriented portfolios should maintain a healthy allocation long term but be even more selective about exposure as political and macroeconomic events could weigh on equity markets across the globe. Fixed income markets bounced back with low single digit returns compared to the dramatic sell-off seen in Q4. Despite the higher returns, bond markets remained relatively benign. High yield continued to do well, as did risk assets overall as seen with the +3.17% performance of the Barclays Global High Yield index. The Fed remains ahead of the rest of the world in raising interest rates while the ECB’s March decision kept their benchmark rate and quantitative easing programs unchanged. We could see the ECB begin changes in the coming meeting as Draghi was more hawkish when he commented that the ECB discussed changing language about interest rates in the March meeting but ultimately did not. From a quality perspective, investment grade spreads remained flat during the quarter while high yield spreads tightened by eighteen basis points to +421 basis points. 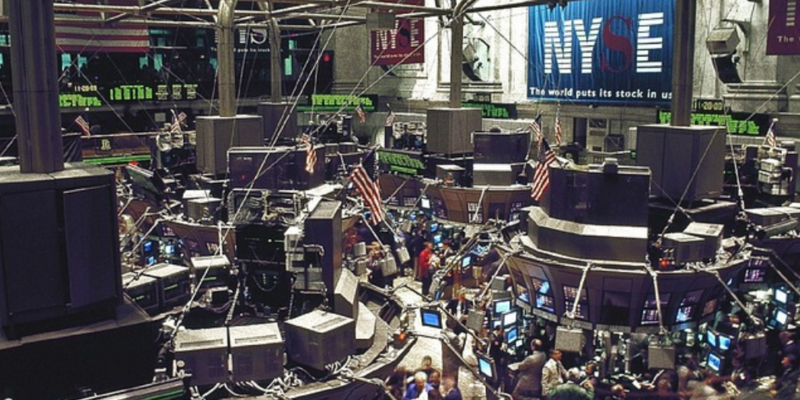 Year-to-date through March 29th, according to one of Massey Quick Simon’s investment managers, high yield mutual fund and ETF fund outflows totaled approximately $7.4B, marking the largest withdrawal since December 2015. Dissimilarly, the flow of funds into investment grade, leveraged loan and emerging market credit remained strong. Bottom Line: Traditional fixed income offers limited return expectations as rates continue to rise and reduced liquidity weighs on bond markets. We have shifted significant fixed income exposure toward floating rate and idiosyncratic credit and believe that active managers will be best positioned to capitalize on uncovering pockets of value across the yield curve. In an effort to remain in line with how Massey Quick Simon characterizes asset classes, we have decided to break apart Liquid Alternatives and Illiquid Alternatives in this newsletter. The Liquid Alternatives section will include hedge funds and funds with approximately three-year terms or less. The Illiquid Alternatives section will include investments with longer time-frames of 3-10 years, such as private equity, growth equity, venture capital, real estate and direct lending. Additionally, information for illiquid alternatives comes on a significant delay, one or two quarters behind and thus we want to provide the most accurate commentary for current Liquid investments and lagged Illiquid investments. With the exception of macro, hedge funds contributed nicely to portfolios in Q1. According to HFN indices, equity hedge led performance generating +3.73% followed closely by event-driven funds returning +3.57%. Distressed took a bit of a back seat after tremendous 2016 performance delivering +1.31%. The pressure that hedge funds have received since the Crisis continues with investors pushing back on the fee structure. In the straight up-market, hedge funds as an asset class have underperformed and thus seen significant outflows. Over the course of the last year, we have seen fees come down and we believe hedge fund managers realize the industry is evolving. We believe these are all positive trends for the space. In regards to year-to-date flows, according to eVestment, the hedge fund space saw $21.9B of inflows in Q1 with macro being the favored asset class. Bottom Line: We believe that the evolution of capital markets has created a variety of challenges for hedge funds to generate outsized returns. We are more selective than ever in building allocations to hedge funds and primarily view an allocation to the asset class as the “risk managed” component of multi-asset class portfolios where clients can gain hedged exposure and short alpha during an increasingly volatile period in capital markets. Hedge funds will be an important component to reducing overall portfolio level volatility for investors. Private equity produced the same results as Q2 2016 while venture capital produced the first positive result for 2016 in Q3. 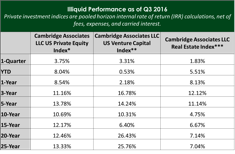 According to Cambridge Associates, all but one of 2004 through 2015 vintage years reported positive results for Q3 in private equity. In terms of 2017, private equity multiples increased substantially during the first quarter of 2017 through February. We continue to monitor valuations and how they impact our private equity allocations. We focus on lower middle-market firms where the entry multiples are not as elevated due to higher fragmentation and less competition. This inefficiency allows experts in the space to take advantage of cheaper purchase prices. After 2 years of massive growth and high valuations in the venture market, 2016 saw meaningful declines. Despite much uncertainty, early indications are positive for the market in 2017. Over the past couple years, M&A has hit historic levels, yet volume has waned thus far in 2017. Contrarily, secondary buyouts have picked up quite a bit. These trends are worth monitoring as they will have implications for the exit strategy for many of these illiquid alternatives. Bottom Line: Over the last several years we have been adding to our roster of illiquid opportunities including, but not limited to, traditional private equity, venture capital, middle market lending, real estate and distressed. We believe illiquids are less affected by the turbulence that exists within public markets and will be able to generate significant alpha over time. We expect the illiquidity premium to generate 300-500bps of alpha per annum over public market equivalents.